Warm and toasty and just in time for winter, the Hot Toddy is a classic hot drink and it is very simple to make. The basic recipe requires only a base liquor, honey, lemon, and tea. The best part is that you can put your own spin on this iconic drink. The Hot Toddy is one of the easiest warm drinks you can make and it can quickly become a new favorite. 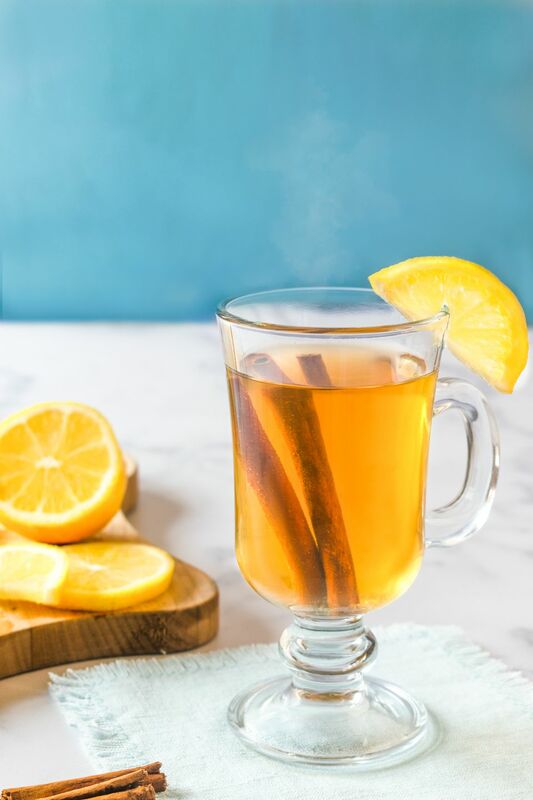 This basic recipe is an ideal candidate for experimentation and you can use The Hot Toddy Collection as inspiration for creating your own personal toddy. Once warm, add a tea bag and allow to steep for about 3 to 5 minutes (or according to the tea's recommended brewing time). While brewing the tea, heat your mug or an Irish coffee glass by filling it with warm water. Once the glass is warm, dump the water and coat the bottom with honey. Add the liquor and squeeze the juice from a lemon quarter. When the tea has steeped, pour it into the prepared glass and stir. Enjoy! Choose you favorite liquor: brandy, whiskey, and rum are often the liquors of choice for a Hot Toddy. Create a Hot Gin Toddy with your favorite bottle of gin. This is perfect for when you feel that sore throat coming on. Even tequila can be used to replace the dark liquors and create a very interesting drink. Don't feel like liquor tonight? Get the same soothing drink without the booze in the Hot Not Toddy. Agave nectar is an excellent substitute for a sweetener and will retain that rich flavor that honey brings to warm drinks. Another option is to use the simple syrup, which should always be in your bar. Cinnamon syrup is an excellent choice. You could really have fun with the likes of this cranberry spice syrup as well. When all the liquid sweeteners fail, simply add a tablespoon of granulated sugar to the mug. The warm tea will dissolve it quickly, though it's best to give it a good stir. Feel free to experiment with your favorite types of tea. Most black and green teas mix well with the sweetness of the honey and lemon, but from there it's a personal preference and some interesting toddies are possible. How Strong Is the Hot Toddy? The Hot Toddy is not one of those drinks that you down simply to get drunk. It is more of an experience and a way to relax, so its alcohol content may be irrelevant for the most part. However, for the curious drinker, here's a general idea of the Hot Toddy's strength. We need to begin by making two assumptions: that an 80-proof liquor is used and exactly one cup of hot tea is used to fill the mug (usually it is less than that). With these, we can estimate that the average toddy is a mild and comforting 6 percent ABV (12 proof). The Hot Toddy has been made and remade many times over the years and it's interesting to see the contrast between classic and modern recipes. These two drinks are entirely different from one another, though they're both worth tasting. Jerry Thomas' Whisky Punch. Toddies are an old style of drink and the legendary bartender, Jerry Thomas has a warm whiskey punch that is both simple and delightful. To make it: Place a single sugar cube in a pre-heated mug and add hot water until it's nearly full (leave room for the whiskey). Stir until the sugar has dissolved. Add 2 ounces of either Irish or Scotch whisky and a piece of lemon peel. Chamomile Hot Toddy. Portland, Oregon bartender, Jacob Grier, has created a warm herbal toddy recipe that is a true delight on a chilly afternoon. To make it: Mix 1 1/2 ounces Jim Beam White Label Bourbon, 3/4 ounce J. Witty Chamomile Liqueur, and 2/3 ounce Meyer lemon juice in a pre-heated mug. Add 1/4 ounce honey syrup and a dash of Scrappy's Lavender Bitters and stir. Fill the mug with hot water, stir again, and garnish with a lemon peel.